Bob started building cues in the early 1960's. In 1968 he took over the cue department at National Tournament Chalk. He founded B.M.C. in Glenview, Illinois in 1969. He also helped set up the WICO cue making operation. He made some point blanks for Gus Szamboti, George Balabushka and for many other top cuemakers and perfected the seamless plastic veneer points that were popular on some older cues. He popularized the flat faced wood to wood joint with collars and the 58 inch length cues. He moved his cue making operation to the Memphis area in 1975 and changed the name to Meucci Originals. He was one of the first cuemakers to make points out of Mother Of Pearl and inlay pictures in 14-karat gold. He was one of the first modern cuemaker to use the forearm as a canvas with intricate inlaid scenes instead of traditional points or inlays. He popularized the sealed Irish linen wraps and was among the first to break into the 5 figure cue market. He is credited with setting the standard for the major cue manufacturers of using metal working equipment instead of wood lathes to manufacture cues on. 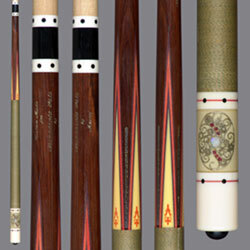 He helped modernize and establish some other cue making factories. He has given training to many of today's top cuemakers and cue manufacturers. He popularized the use of really white maple and the longer pro taper on the shafts. He had more professional and semi-pro players playing with his cues in the late 70's and 1980's than any other cuemaker. He developed a precision robot called the Myth Destroyer to test the cue ball speed and deflection a cue gives when striking the cue ball. He has kept the industry focused on the hit of the cue. He developed materials and construction techniques in his cues that produced more cue ball English, draw and follow than any other major manufacturer. This is one reason why his cues ruled the pro circuit when they played on slower cloth. He has been at the top of the cue making industry for decades, and has had major influence on all aspects of our industry. He pushed the artistic designs and price value of the cues to levels that were cutting edge at the time and paved the way for the rest of us.